The Zinn Life: One Year Blogiversary and Giveaway! Sometime last week (Monday to be exact), The Zinn Life turned one. I started this blog a year ago as my third and final attempt at blogging. My idea was to write about my new health and fitness journey and to actually keep up with a blog. You see, I have a blog problem. Or rather, had. I would start one, get really into it for a few months and then fall off the face of the earth. I told myself that The Zinn Life would be my final attempt at blogging. I was either going to stick with it or give it up. Luckily, I've stuck with it. I've learned a lot about blogging this year. I can honestly say I've come a long, long way. I joined a local blogger group, learned about classes that one of my favorite bloggers was offering (Skill Pop is amazing if you've never tried it, by the way!) and took the classes. I utilized a lot of information from those classes! I learned how to give my blog a brand, set a schedule, a tone and how to make it look like something I would actually want to read. I learned about monetizing in another class. I've done a few giveaways, worked with companies like Influenster to review products on my blog and other really cool things that I never thought I would do. It's been a big, fun, and challenging year. If I had to pick one thing out of everything that I've learned, both from myself and others, is that you need a why. I've said this in my other blogs about my fitness journey, but it's so true. To be good at anything in life, you need to know why. For my real job, I do compliance for federally funded programs. I do it because being in compliance helps the city I work in continue to receive funds, which allows us to continue to serve those that are most vulnerable and need help with housing. For my blog, I blog for me. I blog to remember my journey, my trips and to share those things that hit my heart in the middle of the day, or class or shower and I just need to share them. But I also blog for others like me. For the bigger girls that are working their tails off to like themselves. For people that love food and are trying to find a healthy balance of eating everything they want and wanting to eat what they should. For the people that just want to do a little better in life and have fun doing it. And for those people that, like me, love material gain and a good sale. All of those are the reasons I do this. The reasons that I go to work, go to the gym, make dinner, clean up and blog before I go to bed. This is what I remind myself of when I'm really tired and don't want to blog. That's my why. And why I keep going and hope to keep doing this for a long time! My absolute favorite water bottle from a local store in Raleigh, NC called The Local Squirrel. We had a blogger meet-up there and I saw this and immediately coveted it. The last thing I need is another dang water bottle, so I resisted. Then, when I started thinking about this giveaway, I realized it was perfect. The ladies at The Local Squirrel were super helpful and gave me a discount to help me provide this for you! Check them out if you're ever in Cameron Village. A $25 gift card to Athleta. Athleta is a store that caters to women and their fitness. Their slogan is "Power to the She," which I adore. I've bought some really cute things from Athleta and they carry yoga towels and mats! Bonus - if you aren't a girl or don't want workout items, it also works at Old Navy, Banana Republic and Gap! Cute journal from Target. Because it was in the dollar bin and adorable. You're welcome. I keep one of these in my purse at all times for writing random things down and taking notes in meetings. Hair ties and a bracelet to wear them on. My mom got me one of these silly little bracelets for Christmas and I kind of love it. I always have a hair tie on my wrist, but this bracelet makes it look like an actual bracelet! Practical and cute! To enter the giveaway, simply enter your information below and complete some activities to help keep this blog successful! Giveaway closes on August 30, 2017 at midnight. Share and like away! Thanks for being here! Thank you! It can be rough, but I love it! Congratulations! A year is a long time to keep up a blog; I look forward to the "new" year! Thanks Apryl! The new year will definitely have some fun, new stuff! Thanks for reading! Happy happy birthday, Zinn Life! What a big deal! I love keeping up with your adventures and I appreciate the dedication to workouts and fitness and healthy living, but not without a cupcake every now and then. Thanks ML! It is a big deal and I love just how much other bloggers understand that! And life without a cupcake now and then just isn't worth it, haha. Thank you! I enjoy reading yours too! Thanks for the opportunity to win fun stuff! That bracelet would be perfect! It is seriously a lifesaver! Now it looks like my hair tie is part of my outfit and now just a hair tie! Happy Blog-versary! 1 year is a big accomplishment. FYI - your IG Page is private, you will see an increase in followers if it's public. Weird, I thought I had changed it to public. I'll definitely go fix that. Thanks! Woohoo! Happy 1 yr to you! I hope to celebrate a win for this awesome giveaway too. Lol...thanks! Yay!!! So proud of you!! 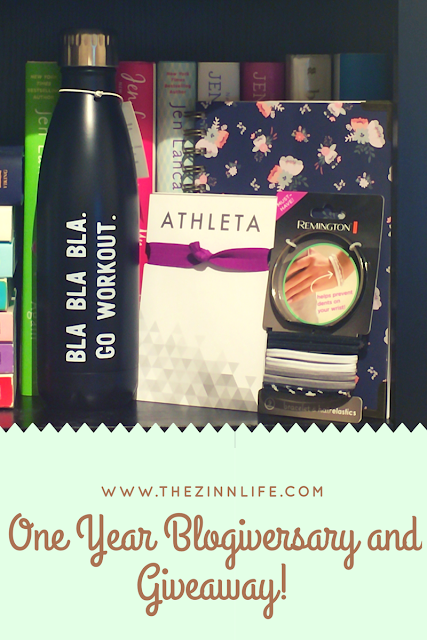 Happy 1 year blog anniversary! Congratulations on your 1 year anniversary. I love skillpop too and that blogger (aka Molly) is one of my favorites also. Thank you so much! That is a fabulous compliment! Thanks so much! That's so awesome, I hope you love it! Happy Anniversary! Congrats on making it a year!